Eating a plum is all about timing. When you get it right, just when the skin gives in a little to a light touch, it is one of nature’s sweet and simple pleasures. But there are times when your optimism coaxes you into biting down too soon, before the fruit has ripened, and instead of being met with luscious sweetness you’re hit with a hard bite and astringent flavour. By virtue of positive reinforcement, when considering plum flavours in anything it is more than likely to be the former, sweeter character that people will anticipate. 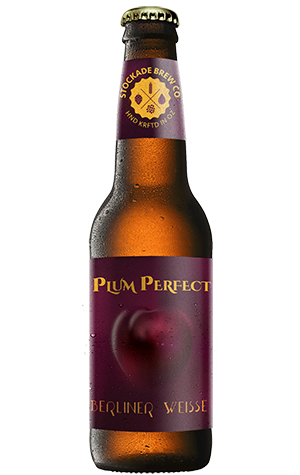 So when you see a beer called Plum Perfect that’s been made with the addition of plums you’d be well within your rights to assume it’s going to be a sweet beer. It’s not. Stockade’s first seasonal for 2017 is a Berliner Weisse that sits firmly in that unripe, tart territory. The plum character is actually very subtle, giving most everything away to the sharp acidity that is the product of the sour mash. The tartness is such that, intentionally or not, it’s one heck of an effective palate cleanser and at just 3.1 percent ABV will sit quite comfortably as a refresher, aperitif or as a decent mealtime alternative to a simple white wine. It’s been made with wheat and pilsner malts so the base is light in flavour and colour; in advance of pouring you might expect it to emerge with a red or pink hue but it’s actually a pale straw colour – think of the yellow flesh of a Teagan Blue plum rather than your Black Doris variety. Between last summer’s Peachy Keen peach gose and now Plum Perfect, the Stockade brewers are certainly finding interesting ways to make the most of the season’s bounty of stone fruit.